Over the last couple of days, I’ve been asked twice what exactly it is that I eat over the course of a day, a week, a month, etc. Obviously you guys have seen some of the highlights (mostly just because they’re pretty) but it’s not representative of everything that I chow down on on any given day – so I’m working on a week of meals and munch for those of you who are interested to pick and choose from as you see fit! There are usually far more tasty meats in my shopping basket, but at present, I’m all stocked up – but I find it helpful to always have a bit of lean ham and turkey in the fridge in case of emergency. For instance, last night before circuit training, I had 10 minutes to eat – so I threw together a spinach, turkey and cottage cheese salad in seconds. No, it’s not the world’s most delicious choice, nor is it the most visually appetising – but there’s a time and a place for it! If I were meat shopping, though, you’d be looking at chicken breasts, prawns, maybe some salmon – all lean, tasty and versatile meats. Yum. 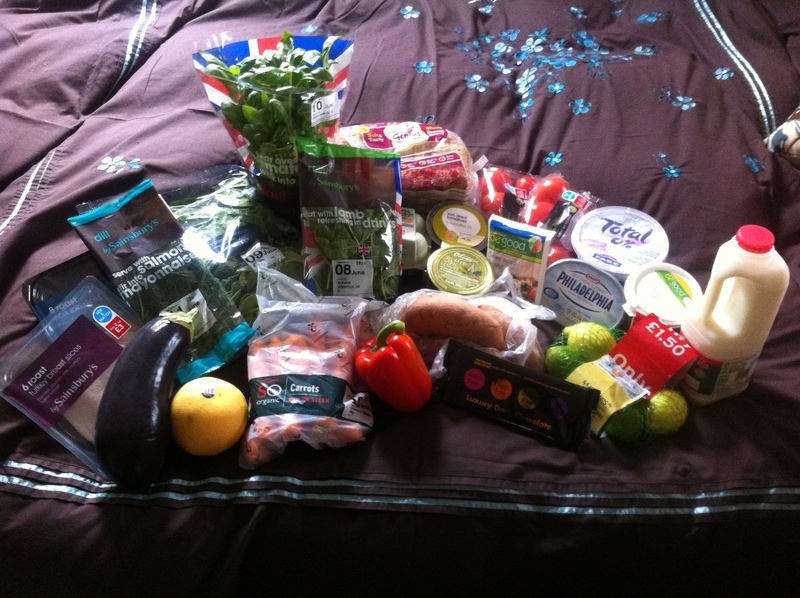 I love eating my greens – and oranges (carrots, sweet potatoes), and reds (peppers), and purples (aubergines). Vegetables are amazing. It’s a myth that vegetables can’t be tasty, although if you’re used to eating very salty or very sweet junk food, it may seem that way at first. Usually, though, it’s because they’re not flavourlicious enough. They’re lacking in flavouliciousness, if you will. Yeah, I made that word up. So sue me. 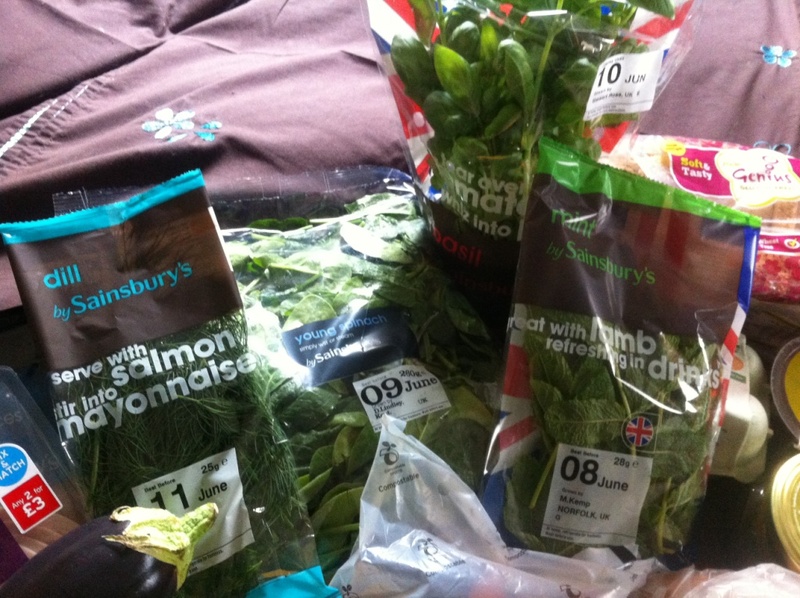 I already have a cupboard full of herbs, but I just love using fresh herbs in as much of my food as possible. It just gives that extra bit of kick – flavourliciousness – to everything. So that’s fresh basil, dill, and mint (parsley’s another big one – but I have that already!) You’ll notice on the top picture a big bag of lemons and limes too – no, these are not for cocktails. Most of the time. Nope, I’m going through a real phase of loving a bit of citrus flavour with my herbs – whether it’s lemon, mint and basil on chopped carrots, or lime, chilli and honey on sweet potatoes (I’ll post this later, promise! ), I am an addict without shame. A rebel without a cause. 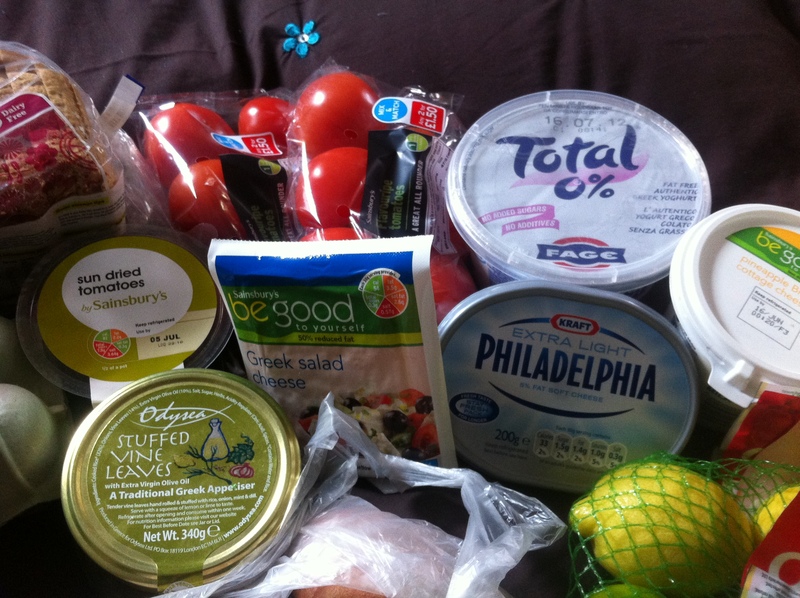 I’m not a big stickler for the low-fat, diet options on these things, by the way – but these were all on offer, and I’m funding a PhD, so I will always choose what’s cheap (and then spend £3 on stuffed vine leaves – I’m a master of prioritising). But you can do so much with this stuff! Feta (or Greek salad cheese, if you’re on the budget option) is always a good choice with salad (especially with a drizzle of lemon, basil, olive oil, etc). I really love cheese, and it’s one of those things I’d really miss if I weren’t allowed it – and feta is a much healthier and to my mind, more satisfying choice than a big chunk of cheddar. Although there’s definitely a time and a place for that too. And Greek yogurt is a real wonder to me – a dollop of that, with a teaspoon of honey on top of half a grapefruit is one of my favourite breakfasts. Or, mixed with honey and a handful of cashew nuts… Yum. I think this is one of my big learnings from this healthy-living thing – making every meal really damn tasty, rather than just trying to fill a hole with the same thing you have every day, means it’s no hardship to lose a few calories. It’s definitely worth the extra effort! That, there, is the most expensive loaf of bread in the world. 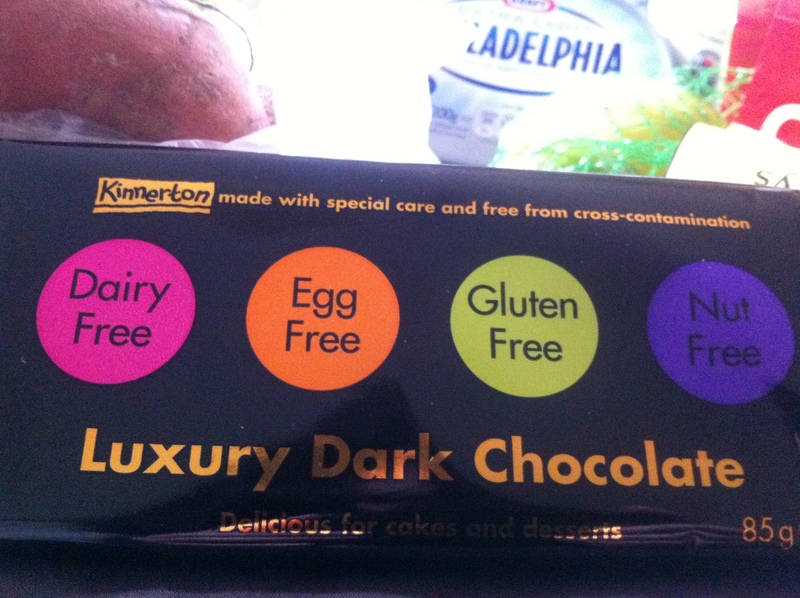 Alas, gluten-free living, you are expensive sometimes. Fortunately, where bread used to be a staple of my diet (toast for breakfast, sandwich for lunch, etc) it’s now something I only have when I’m really craving it (read: when I’m hungover), so that loaf will go in the freezer in case of such emergencies. Far more important, however, are eggs. Omelettes, frittatas (frittatae? ), boiled, poached… Eggs have become a very big part of my diet these days. Apologies to those of you who are lactose-intolerant – please do let me know what you do instead! Yes, that is chocolate. And no, I don’t feel guilty about it, because I don’t plan to eat the whole bar in one sitting these days – that bar will last me a good couple of weeks. It’s really, really important to be able to allow yourself a square of chocolate once in a while if it’ll make you feel better – because if you’re going to make a lifestyle change, then you need to be able to live with your choices permanently. Treating yourself is essential! Now, I know a lot of people are put off by healthy food because it’s apparently more expensive – but I don’t think that’s the case if you plan ahead. 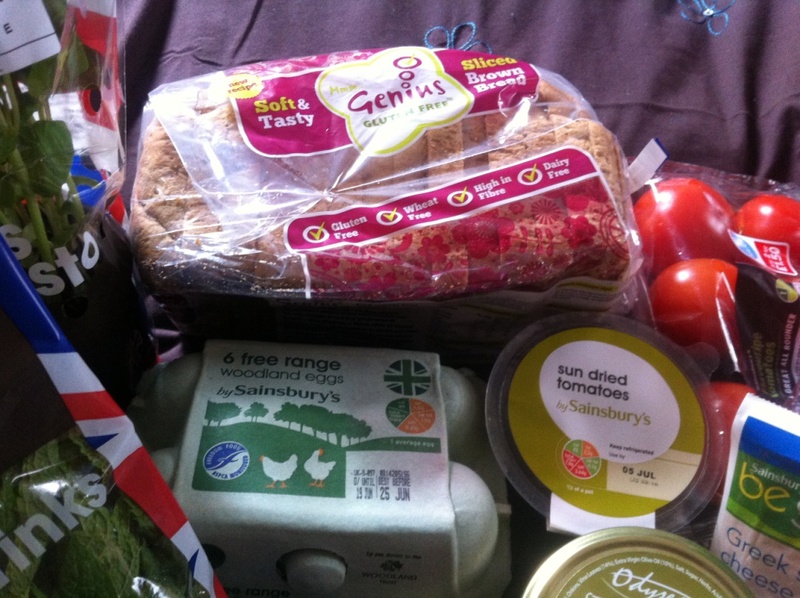 My whole shopping basket cost £32 – and given the gluten-free items (bread and chocolate) accounted for £5 of that, and I have a friend staying with me all weekend whom I intend to feed with this stuff, I think that’s pretty good going. I’d say that’s probably the best part of a week’s food in there, at least. So it’s not expensive, if you know what you’re doing. And on that note… I’m going to rustle up some lunch. Bon appetit!